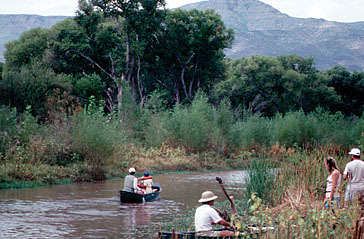 The Verde River is a significant resource in the State of Arizona. It is one of the desert’s few free-flowing rivers sustaining a large wildlife population and lush riparian community. 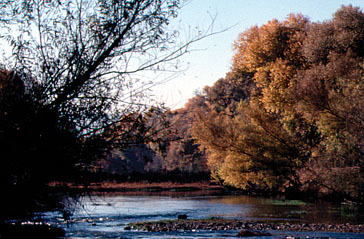 The River and its adjacent plant communities provide food and shelter for the wildlife traveling along its banks. This River corridor remained virtually unchanged except by natures actions until the discovery of valuable deposits of gold, silver, and copper in the nearby mountains in the 1800’s. Then came large mining operations, processing plants, cattle grazing, diverse agriculture operations, and later gravel operations in the River. The State Parks Board initiated efforts to protect a portion of the Verde River in 1971 when a parcel of property along the Verde River was brought to the attention of the Board as a potential Park site. Working closely with the local legislators, the Verde Valley Chamber of Commerce, and the Community, the Parks Board received authorization and an appropriation from the Legislature in 1972 to acquire the Dead Horse Ranch property. The appropriated funds were matched with Land & Water Conservation Fund monies for the purchase of Dead Horse Ranch. The property consisted of over a mile of river riparian land to rolling hills and offered a wide range of recreational opportunities. The importance of this River’s resources has been recognized for years. The 1983 Statewide Comprehensive Outdoor Recreation Plan identified the need for easy and safe access to existing rivers and streams and for open space in rural communities. The next priority identified in the Plan that showed a dramatic increase in statewide importance was the need to preserve land in its natural state for environmental education, interpretation, wildlife viewing, hiking, riding, walking and other passive recreational pursuits. Protection of habitat for endangered wildlife and critical riparian areas was recommended for immediate action so areas could be set aside for future generations. 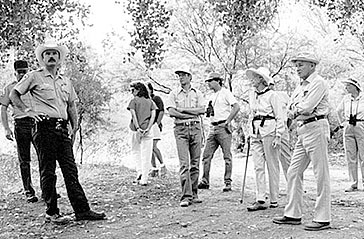 Late in the summer of 1985, Governor Bruce Babbitt, State Land Commissioner Bob Lane, and Dan Campbell, State Director of the Nature Conservancy, met at Dead Horse Ranch State Park to hike along the Verde River. Following the hike, Governor Babbitt requested that Bob Lane prepare maps showing the ownership of all lands adjacent to Dead Horse Ranch State Park with river frontage. The Governor then requested Dan Campbell to quietly initiate contacts with landowners along the Verde River in this area to determine how receptive they were to selling their properties for open space and passive recreation. Mr. Campbell began making contacts with landowners in the vicinity of the State Park in September 1985. Cap Ireys who owned property on the east boundary to the Park was his first contact. The negotiations were kept low key because the funds of acquisition had not been appropriated by the legislature. Mr. Campbell received a willingness to cooperate on such a project from the majority of the individuals contacted. Dr. Don Charpio, State Parks Executive Director, reported to the Parks Board at its March 14, 1986, meeting that Dan Campbell’s negotiations for land along the Verde River was going well. The Nature Conservancy had purchased the Ireys property and was in the process of purchasing options on two other parcels. He advised the Board that the key to the ultimate acquisition of these properties was tied to the approval of the Verde River Protection Bill that included $2 million to be spent on the acquisition of lands on the Verde River. State Parks had been designated as the primary agency for the acquisition and management of those lands. At that time the bill was going through the legislative process. House Bill 2510 related to the Plan 6 Agreement passed during the 1986 legislative session. The Agreement required the replacement of habitat for endangered bald eagles and other endangered species impacted by the construction related to the Central Arizona Project. Other requirements were for the State to establish the Verde River Protection Fund and to provide not less than a $2,000,000 appropriation. The Bill provided the authority and the appropriation to the State Parks Board to acquire real property, improvements, and easements to enhance and protect the riparian habitat along the Verde River. With the cooperation of the State Land Department, the Board would acquire properties as prescribed in its enabled legislation and consistent with the following criteria: 1) Provide protection and preservation of the Verde River; 2) Provide habitat enhancement and/or habitat protection; and 3) Can be managed most efficiently by the Arizona State Parks Board. The legislation passed on April 9, 1986 with an emergency clause and became effective immediately. 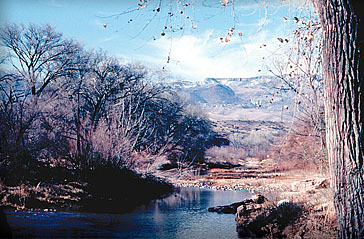 By May 1986, State Parks had established a Verde River Acquisition Task Force including representatives from the Governor’s office, the Nature Conservancy, State Land Department, and Arizona State Parks to identify the most desirable properties meeting the criteria and to recommend properties for potential acquisition. The Task Force determined that the area of concentration should be those properties along the Verde River between Tuzigoot Bridge and the Bridgeport Bridge in the Cottonwood vicinity. A list of all the property owners along the River in this location was compiled by the State Land Department and maps were produced to show the location of each parcel. From this information, the Task Force compiled a list of 35 properties in priority order ranging in size from less than one acre to over eighty acres. This list was shared with Governor Babbitt at a meeting on June 19, 1986. The Parks Board authorized staff to pursue the acquisitions of these 35 properties in priority order at its July 11, 1986 meeting. The project was initiated with the understanding of all involved that the estimated value of the desired properties far exceeded the funds available. The Parks Board decided early in the process that acquisition negotiations would only take place with willing sellers. Following up on the contact options obtained by Dan Campbell and the priority list established by the Parks Board, staff members were assigned to handle the acquisitions. Jon Clow, Park Manager, Dead Horse Ranch, and Charles Eatherly, Special Projects Coordinator, began meeting with the property owners in 1986. The negotiations seemed to go slowly as the first step was to meet with the property owners and advise them of the purposes and potentials of the Greenway and secure the approval to proceed. Most of the properties required a survey as only parts of the land areas were to be acquired by the State. Following the surveys, appraisals of each individual parcel were completed to determine fair market value. The surveys and appraisals were discussed with each of the owners, and if they were willing to sell, escrow was opened and the acquisition proceeded. At this point in the process, the Governor’s office became very concerned that very little progress was going to be made by the time the Governor left office. Thus, one of the Governor’s staff advised Charles Eatherly that they would help expedite the procurement processes. Mr. Eatherly expressed appreciation for the additional assistance. However, within a two-week time frame, a call was received advising Eatherly to continue because the Governors’ staff found that to secure the necessary professional services the procurement process had to be followed. A special presentation by Governor Bruce Babbitt and the State Parks Board on “The importance Of The Verde River - A Resource For All Generations” was held in Cottonwood on November 8, 1986. All of the property owners along the Verde River and the public were invited to attend. In the last meeting Charles Eatherly had with Governor Babbitt on December 30, 1986, the Governor expressed his appreciation for the diligent work and the progress that had been made. By that time, State Parks had acquired 10 properties totaling 258.62 acres and had expended over $1,496,728 from the original appropriation. By January 1988, State Parks had acquired over 318 acres of Verde River riparian lands with over $250,000 of land value having been donated to the project because of the enthusiastic support of the landowners along the Verde River Greenway. The Parks staff began working with the Verde River Greenway Ad Hoc Advisory Committee in May 1988. Membership on the Committee consisted of representation from the Game and Fish Department, U.S. Forest Service, Town of Cottonwood, Town of Camp Verde, Town of Clarkdale, Yavapai County, Verde Valley Chamber of Commerce, Verde Valley Horsemen, the Audubon Society, and interested citizens. The Committee was established to provide input to the staff on ways the Greenway might be completed between Tuzigoot Bridge and the Bridgeport Bridge. The Committee expressed its feelings that time was of the essence in acquiring river frontage and as State Parks had been successful in its efforts to date and had a good reputation with the citizens of Verde Valley, it was the most appropriate agency to continue the Greenway Program. The Committee encouraged State Parks to expand its efforts on the Verde River. The Committee agreed to establish a support group to support the goals of the Greenway. They also agreed to support legislation for additional acquisition funds and operating monies. The Committee was very concerned with the lake of knowledge and understanding the local residents had of the importance of the Verde River and the Greenway. This concern lead to the establishment of Verde River Days held annually at Dead Horse Ranch State Park. It gives those interested in wildlife, environmental and outdoor issues a place to share information with the general public. At the second annual Verde River Days, former Governor Bruce Babbitt, considered the Father of the Verde River Greenway, said “Protection of the river represents the most important task for local leaders in the years to come. We still have a chance here in the Verde Valley. That chance is gone on the San Pedro, the Gila and much of the Salt (rivers). It’s not enough to have a State Park; it’s not enough to have a riparian corridor; what we have to do now is work to protect the Verde River from start to finish.” Verde River Days have become a very popular annual event held the last weekend in September. Although the membership on the Parks Board has changed many times since 1986, the Board has continued to support the Verde River Greenway. The Parks Board has continued to acquire lands along the Verde River as money and opportunities are available, and as of March 17, 2004, (the date of the last acquisition) the Verde River Greenway encompassed 600.33 acres (See Appendix 2). The Board and the staff continue to investigate lands for potential acquisition for the Greenway. Because of strong community support, the Parks Board at its May 2005 meeting voted to expand the Verde River Greenway by more than three times its present length by including the entire stretch of the Verde River, from the Tuzigoot Bridge to Beasly Flats below Camp Verde. To more appropriately recognize the significance of the Verde River protection, the Greenway has become the Verde River Greenway State Natural Area.